Making marks is the essence of art. It's what we do with anything that can contrast with the surface it's on. Scratch a rock with a nailfile and you have the beginning of engraving. Pick up a burned stick and drag it across the stone and you are drawing. Stir some water into the black ashes and drag a wad of your hair through it and you're painting. 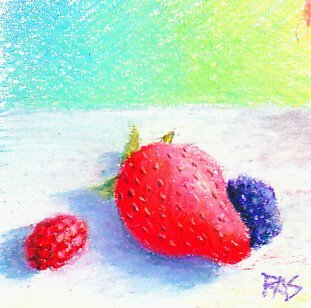 Oil pastels can emulate almost any mark you can make with any other medium. That's the beauty of oil pastels. They are versatile. In Berries, the example above, I've used hatching, crosshatching, blending, pointillism with dots, careful dots and scraping to create the different textures of the backdrop, the surface, the berries and the seeds on the surface of the strawberry. It's in my Mont Marte A5 Visual Art Diary done with Erengi Art Aspirer oil pastels. At least, that's what I'd be saying if I saw this in an exhibit with a mat around it in a nice frame. Then I'd probably walk away. I didn't plan this as an abstract painting and this type of abstraction isn't my cup of tea. 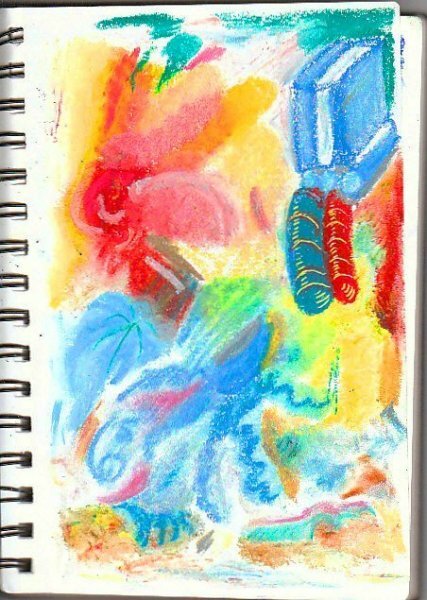 What it did though, was show me some of the different ways I could make my oil pastels perform. There's those bright yellow details under the red and blue tubes in the upper right where I first tried Sgraffito. I scraped them with the same nail cleaning blade I used on my good tropical fish painting and had the courage to try sgraffito in that painting because I'd doodled around with it on a Making Marks page. When you're not worried about whether it's any good or represents anything, you can let yourself go. You can sweep the colors across the page or dot them in little blobs, zigzag, squiggle, scumble, do anything you want. I didn't do this as an example of a marks making page. I did it just to fool around on my birthday in my sketchbook and see how the sample colors mixed. I don't have a strong orange in my sample sticks, not in any brand. Just a bright yellow Neopastel, a bright yellow Sennelier and a slightly warmer bright yellow Holbein. I found out I could get a bright full strength orange mixing these colors with the Sennelier permanent red -- a valuable mixing experiment because I may want to do an autumn landscape without having Cadmium Orange in my palette. Even though I have bright oranges in some of my sets, I might not have them with me if I go out on a stroll into an October forest with a handful of pastels in a candy tin. Marks pages are great for color mixing experiments. Best of all, I could have done this same page when I was seven or eight years old and couldn't draw to save my life. That's right. This exercise is the sweet easy dummy one, that if you've been convinced you couldn't draw from school age is a good way to break the block. Play with your pastels. Don't organize it. If shapes form, detail them or not -- it's like finding shapes in clouds. I've got a primitive animal down in the lower left that looks like the sort of animals my five year old granddaughter draws. That's great! I let go of being a grownup and let this happen. I stuck little stubby legs on it all in a row without worrying about proportion because that's what I felt like doing at the time. Repeat this exercise anytime you're stuck. If you're frustrated with a good painting that's in progress and just can't get it, grab your sketchbook and start doing a marks page. Use the colors you feel like at the moment and the motions that come up on impulse. Let go and loosen up. It can do a lot to clear your mind and waken your creativity. I've been drawing and painting for about fifty years, counting age four as the point I got serious about writing and making marks involved struggling to create intelligible upper and lower case letters. Yet I still find this exercise valuable. No one could tell you from Picasso or Georgia O'Keefe while one of these is in progress, honest. If making marks in formless, disorganized ways bugs you and seems pukeworthy, if that page of free expression unbounded by taste or sensibility grossed you out, then be you. Organize your Making Marks page and carefully set out little patches of each type of mark, make your mixing tests long narrow rectangles with pure color at each end, lay out your sketchbook pages neatly. That's being yourself -- don't fall for the trap that Being Yourself means being loose or doing exactly what the teacher did. It will do the same thing for your creativity as the gooshy one did for mine. If you are worried about the cost and wasting your supplies, that's where it helps to purchase a large cheap sketch pad or spiral bound sketchbook. I like the spiral bound hardback ProArt sketchbooks because they don't need a drawing board under them and fold out flat for scanning when I've done a good drawing. But you get 125 sheets for cheap in a Canson Biggie sketch pad and that one would let you throw your Making Marks pages all into a separate envelope and hide them while you pin your good studies on the wall for people to see. Use what suits you, but whatever you get, make sure it has lots of pages. It will be well worth it when you reach without hesitation for a Sennelier because of how that blended over an Erengi. Every time you do a page of Making Marks, you are teaching the dumb little animals at the end of your arms how to do the steps and stages of spectacular painting and drawing effects. Cool Swirls is a real abstract, a small one that I created spontaneously. 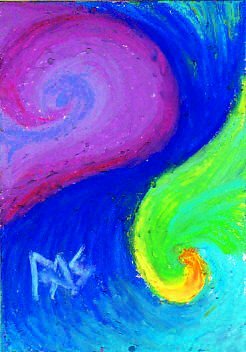 It started with one swooping S-curved mark and then I started blending around and over it with other colors, using my Erengi Art Aspirer oil pastels on a small piece of watercolor paper. Sometimes when you do a page of Making Marks, you can get ideas for something like this. Go ahead and do them. The exercise is intended to spur creativity, it's a warmup. If you see something that looks cool and starts turning into something beautiful, finish it. Or start over on a better sheet of paper, copy just the bit that came out well and continue it there. It's okay to do the same drawing twice. That's called a "Study" and it turns up over and over in the sketchbooks of all the awesome professional artists who get thousands of dollars per painting. You do it small in your sketchbook and then bigger on a good piece of paper, then frame it with an archival bat and give it to your agent or a gallery owner. The practice of drawing something more than once usually refines the later versions and brings them closer to what you intended. That is what's meant by "your vision." Making Marks is a good warmup for any art session. If you're stuck, bored, just don't know where to start, pick a page and start doing random shapes. You will start to find out what your favorite marks are. 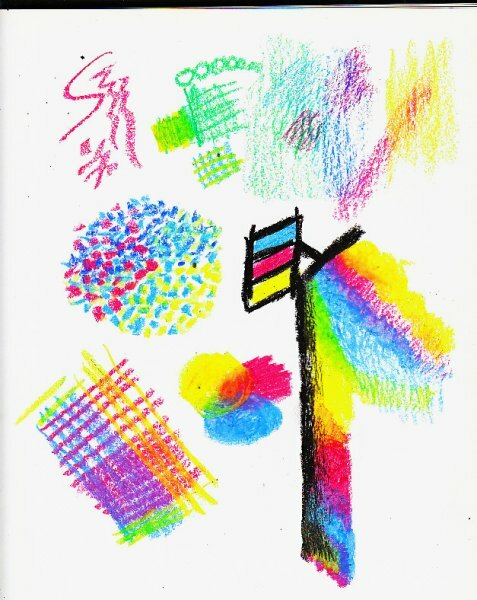 My Making Marks page is not a neatly organized example of everything you can do with an oil pastel. It has a lot of blending in it because even where I had lines and squiggles, I went back and blended them. I happen to like blending a lot. Painting is being yourself. So as you practice the marks you'll start leaning toward one type or another. Make sure you at least try all of them, because eventually there will come a time you need to use something that isn't your favorite thing because it's exactly the right technique for that part of what you're doing. I didn't like colored crosshatching much but it made a great backdrop for Berries. It helped push the more refined, detailed berries forward from what looks like some kind of colorful woven screen behind them. So every texture you create, invent, design and fiddle around with on a Making Marks page has a good potential use somewhere. Muddy color combinations may be exactly the right hue of neutral color for a patch of mud in the middle of a country road. Goofy tentacles waving all over everything may make a realistic sea anemone in a coral painting come alive instead of looking like a stiff hairbrush. There are no errors in this exercise. There are no standards. There is only whether you like it or not and what your hands learned from doing it. What making marks at random in a sketchbook gives you is priceless. That's control of your medium. You know exactly how it feels to squish a Sennelier iridescent white into a dark color to get a very pale pearly effect or a slightly pearly effect. Your crosshatching lines start to become straighter and smoother when you do a lot of it. Or begin to curve naturally around forms to give added depth and roundness. A lot of the techniques you see in fine art begin to come back in marks pages without planning. When I get a new set of oil pastels I like to do a color chart. That's another mark making exercise, usually accompanied by some blending or smudging. Then I'll go trying things like this and fool around with it or do a very small piece just using those new supplies. Once you're used to realistic drawings most of your experiments may be good small studies if you don't like gooshy abstracts. It's good to break out of that once in a while and loosen up though. So if you haven't dared let yourself get messy, now's the time to do it. Despoil a page and teach your hands. Have fun playing with the colors and making marks. Here's another Making Marks page from my sketchbook. This one demonstrates pointillism, hatching and crosshatching, blending and CMYK mixing. I happened to start with a magenta. It made me think of printers' ink colors, so I pulled out a cyan-looking light blue and the yellow and a black. I started demonstrating pointillism and optical mixing in a very bad video that will never make it to YouTube. Then I kept going with other types of color mixing, crosshatching and hatching, finally blending. I put a sample of green next to the mixed green to show how close the cyan and yellow combination comes to a bright green stick. I fooled around all over the place with it. I've removed the three beautiful drawings of birds from the nearly-untouched sketchbook this Making Marks page resides in. Once I wrote this page, I looked at it and realized what I was doing -- saving it for later until I could give an entire afternoon to the next pencil or colored pencil bird study in detail. I saved it for three years without adding more birds or using it for sketches because it was the Good Birds Book. So I removed them and hung them on my wall, to be framed next month. The sketchbook is now my demo sketchbook and I'll do plenty of Making Marks pages later on as I get into color mixing with different brands of oil pastels and other casual illustrations. If any turn out to be good drawings, they can be stored in it or pulled out and framed like the three birds pages. They're good. There's nothing wrong with having a good drawing on the first page of your sketchbook. Just don't let it elevate the book into something too precious to ever be used!